The third year of the exclusive TV Sports Awards, a special occasion of recognising success and innovation in the sports media industry, whilst providing a platform for social change and raising money for the Play for Change charity. 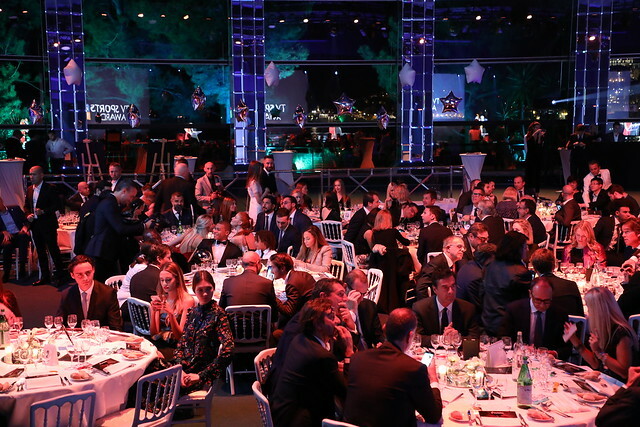 The TV Sports Awards was held on 23rd October 2017 at the fascinating Salle des Etoiles during the international sport media conference Sportel. The ceremony was hosted by two talented sport presenters, Marc Edwards and Rachel Stringer, who undoubtedly delivered a fantastic act. Applying for an award was open to the whole industry and this year saw a very high caliber of nominees. There was a huge interest in the Best Sports Project award category, which is a new category and awarded two winners: Tennis TV by ATP Media and DAZN by Perform. Well done to Perform with three wins overall and was casted as Sports Media Company of the Year. The 2017 edition was better than ever before, with new and exciting categories, a revised application process boosting transparency and fairness, and more entertainment. With an audience of 300 professionals from the world of sports media, the ceremony began with the presentation of the Tuttosport Golden Boy, highlighting Europe’s most impressive footballer under the age of 21. This was awarded to the Paris Saint-Germain football player: Kylian Mbappé. A special Play for Change award was presented to highlight an inspirational athlete who has made an outstanding contribution to social change. Juan Mata, midfielder for Manchester United, won the Play for Change (PFC) award, recognizing his inspirational and influential work with the Common Goal project. The 2016 award went to Anne Wafula Strike for her work with AbleChildAfrica and Olympia Wafula Foundation. This year, Anne formed part of the Play for Change Award judging panel. Watch Juan Mata's acceptance speech of the 2017 Play for Change award. Juan Mata is the highly decorated midfielder for Manchester United and is the first footballer to get involved with the Common Goal initiative. Common Goal's aspiration is to unite the football industry in the name of social change. All profits raised at the TV Sports Awards go towards the Play for Change sport and education programmes, which are dedicated to improving the lives of under-privileged children and communities. The impact of the funds raised from previous events has enabled Play for Change to make a huge difference, and last year the event raised enough funds to help a further 1,200 children in Nepal. You can still help to make a difference! If you are interested in donating to our programmes or would like to find out more, please contact info@playforchange.org.